Last night (technically early this morning), we walked home in 0 degrees Celsius with our breath all smoky and the frozen air seeping into the teeny holes in my tennis shoes. Of course, the city has not turned on the heat yet–it has to be below 12 degrees three days in a row. We have one space heater in the living room. Meaning the bedroom is….well…..freezing. Literally. Frozen. An ice cube. And we own two comforters. All night I shivered in my multiple layers of pajamas and socks, just trying to hold on until this morning, when I would warm up in a hot bath (don’t ask why I didn’t get up and take one during the night). 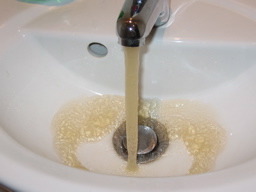 That color of water looks familiar, we have that color of water when our filter to our well is not hooked up. That’s why our sinks, toilets, and other fixtures in this house look stained!